All photos made with Nikon D2H. "The War of American Agression." Ever heard of it? It's how communist Vietnam refers to the Vietnam War. My recent visit to Vietnam was a real eye opener. The propaganda still exists. Ho Chi Minh, the leader of the communist forces in the war, is a national hero, his body preserved in a mausoleum visited by millions of people every year. A film from the 1960s shown at the Cuchi Tunnels visitors center shows Vietnamese snipers, including teenage girls, smiling and singing as they go off to kill American soldiers. 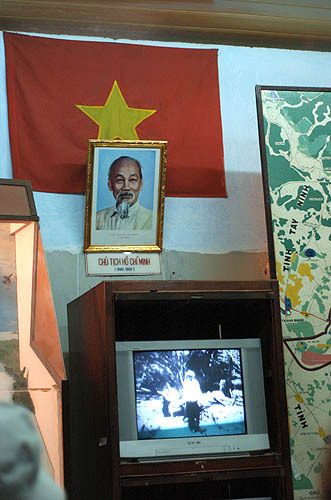 A portrait of Ho Chi Minh hangs approvingly above the video. Guides at the tunnels proudly display the booby traps that killed with cruel spikes. In other museums gruesome photos showing victims of Agent Orange and napalm shock viewers. Reconstructed torture chambers used by the South Vietnamese (U.S. allies) seem haunted, and eerily ready for use. War is a messy business that often compromises the principles of people who would otherwise live peaceful lives. I have very little personal experience with it. Recent wars in Iraq, Afghanistan, Kosovo, Rwanda, and Sudan are sterilized by the media. Seeing the remnants of a war fought over 30 years ago in Vietnam have left a more lasting impression on me than anything I've ever seen in a movie or on TV. Ho Chi Minh, a jack-of-all-trades and revered teacher who loved to spend time barefoot, living simply, with children around, smiles approvingly as a film plays that encourages young peasants to take up weapons and kill Americans with smiles on their faces. Young soldiers guard Ho Chi Minh's simple residence, more like a tree house than the U.S. president's white house, while tourists file past to catch a glimpse of the sparse funishings. 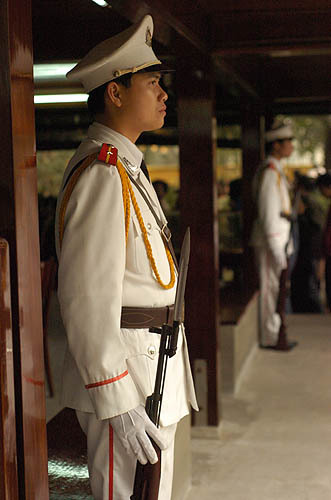 Vietnamese men are required to serve in the military for 3 years after secondary school. Vietnamese line up and wait hours for their chance to file past the preserved corpse of Ho Chi Minh in his darkened mausoleum in Hanoi. 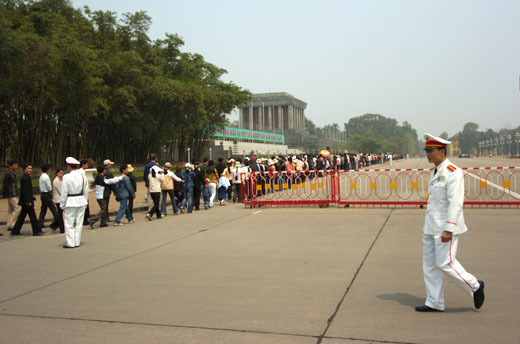 Strict silence is imposed and the lines of visitors are kept moving by soldiers who maintain order with automatic weapons and ungentle pushing. 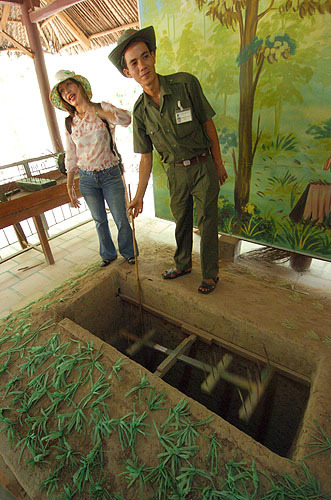 A tour guide proudly displays a swinging spike trap. After it is tripped, it is weighted to reset itself in order to kill again. 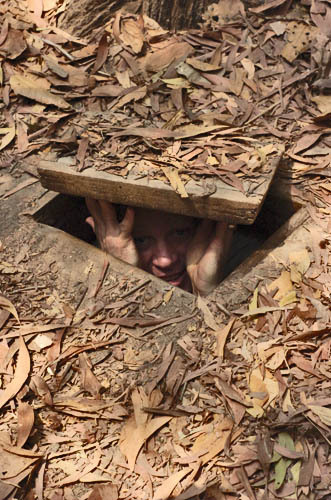 A tourist squeezes into a tunnel used by the Viet Cong. The tunnels housed entire communities and were so well concealed that U.S. forces built an installation on top of one, and suffered mysterious losses for a period of three years. 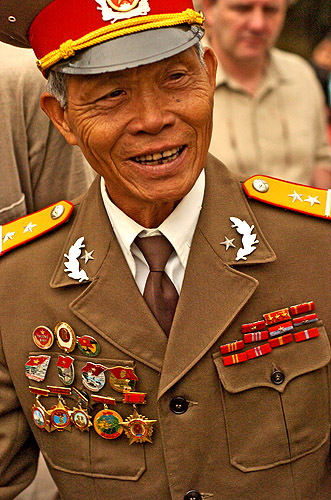 One of Ho Chi Minh's generals from the war-era proudly still wears his uniform. He was a friendly man, treated very respectfully by other Vietnamese, and eager to pose for photos with American tourists. 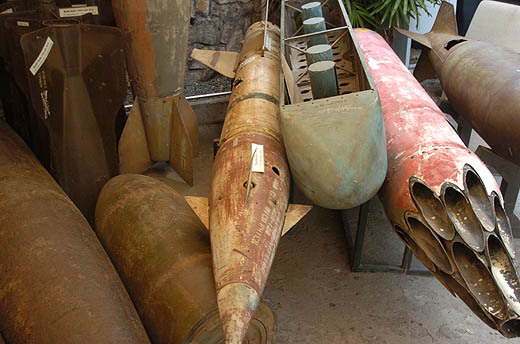 Relics of the American war machine sit and rust in a war museum. They are piled haphazardly. The contrast of their display and the mausoleum of Ho Chi Minh is telling. One wonders how the tourist sites would be different, had America been successful in stopping the communists in Vietnam.